Nowadays getting a job is more of a problem than a solution. Many people have to roam here and there for a decent job. After all this mess there is no surety that the person will get the job. The world is already in the scarce of jobs and day by day the competition is also increasing. This creates lots of pressure on the adults and the young mind who wants to settle in their life. But to overcome this problem there are many online jobs people are offering. The job is offered to those people who seems eligible by their portfolio and can work accordingly. Depending on the work and the hardship, they are being paid after the work is done. The people can bid for their preferred price for the work from the person offering the job. Few people who possess extra additional skills, who have the faith that they can at least do something good then for them there are the chances of getting a job. The least requirement for him is to be a literate and can do certain work very skillfully. Craigslist is a site which provides information about many things. It gives the opportunity to many people to post their problems at a very low cost. People can post their ads and get help accordingly. 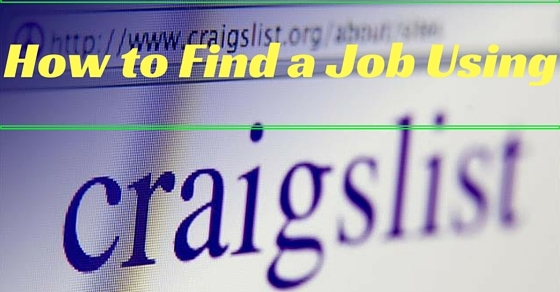 Craigslist is a very good website that helps many people to connect, find social groups, find jobs, volunteer and do an internship, house, room, freelance temporary or permanent jobs. Craigslist is the site which can give you many job opportunities. One person can post his/her resume as they like. Many people are on this site which can help you and get you to have a good job and better opportunity. It’s actually free and the person can buy, sell and post ads if they want to. We can get a job on craigslist by following few simple steps. The first thing to do is to search Craigslist on Google. Then select the homepage of the Craigslist i.e., http://sfbay.craigslist.org/. On the bottom there will be an option of log-in, if you are not a member then click on create an account to create one. After that give your email id and a password that you can easily remember. After this, the site will send you a verification mail. Click ‘I Accept’ from your email id after opening the mail they sent you. From the next time whenever you want to login fill the details you gave while creating an account. After you enter all this make sure that you don’t share this information with anyone else. This is personal information which shouldn’t be shared with anyone no matter what. There is a possibility that the person can misuse it if they got hold your personal data. It should be confidential and you should also remember it. Don’t make the password so complicated that even you can’t remember it. After you log in please enter the country you are in and after that choose the city you would prefer to work. Then the job offered to you will be according to the city you want the job in. After this, the page of the jobs available in that city will appear. Scroll your cursor down and then you can see the option of ‘Post your resume’ there you can post your resume or copy paste it. Then the employers can see your resume and compare it with others and if they like it, they can offer you the job. The top line of the page will show your city and the down there you can see the jobs available there. You can choose the job there or you can go to search button and type the job you want. Click on “Title Only” or “Entire Post,” and then click on the “Search” button. Chose from the list, the job you want. There is also a section where it shows the neighborhood cities in which jobs are there. If you wish you can select that too. Click on the job name you are interested in. Then select the name and then the whole information about the job and the workplace will pop up. If you want to know more about that job, then try and find out the qualifications and experience needed for it. See and analysis that if you fit in that job and if you are able to perform that job perfectly. You can also find the salary information there. You can find the recent job offers on the top of the list. The later ones are the jobs which were offered much time before. You can also contact the employer from there concerning your problem and then can post your issues and your interest. You can also talk about how serious you are concerning about this job. If you want to find more about that job then you can also ask your queries. You can share your resume with the employer if you want to. You can also send your phone number. This will help him to contact you easily. You can mail him the resume and your contact details. But make sure that you don’t send too much of personal information because it may be a problem later on. There is always email if you want to contact. No need to share too much of personal data. After filling this information and sharing the needed data you have to patiently wait for the reply for few days. If you keep pestering the employer he may get irritated and ignore you. Don’t send him too many emails or call him for no reason. This will create a bad impression. Sending too many emails can spoil your image before him. Try to be cool and calm and send only needed information to him. Don’t panic and wait for the result hoping for the best. Always be careful about the work you want to take. The people who give job ads on the craigslist don’t post the information completely on the headline. Read about it carefully. See the requirement and everything with attention and then decide that if you want to take the job or not. First, go to the upper left corner of your post. Then you can view an email address which is like any normal email id. Then anatomy’s craigslist may also appear. Email address is often highlighted in blue. Select the email address by long pressing the left button of the mouse on the email address and sliding it upto the end of the email address and then copy it. You can note it down in a copy or somewhere if you want to keep it for later use . After selecting you can paste it into the box of the mail you are composing to send it to the employer. If you are going to communicate through emails then you need to specify your job title, what is your email for and for what purpose you are sending it to him. For example, “The waiter job”. This will make things a little clear for him as he may get many mails in a day and you must drag his attention on your mail as it is an important one. He shouldn’t miss your mail. You can use the body of the mail to show the employee how interested you are in the job and can share your experiences related to similar work to impress him by your skills. You can also tell him about your aspirations and hope related to this job. This will help you to impress him as it will be beneficial for you. Check your mail consistently to know about your writing mistakes or grammar mistakes. This will create a bad impression if there are some mistakes in your writing. You don’t have to show him your faults but your skills and make sure you do that. Read the ad carefully and fill out all the information they are asking for. They will need some of the information as per their choice to make them see you as a preferred candidate for their job. Don’t use odd languages or act rude in front of those employers. They are giving you or offering you a job. You must be polite and gentle and make a good impression on them. You have to polish that gift and make sure you are the best one around. This will ensure your job. Therefore is it very much essential to pay respect to those people who are offering the thing you want- money. After all, this makes sure to have a strong heart and find a good job for you. Nobody wants an uninterested lazy guy to work for him. You have to impress your employer with your resume, experience, and results. After finding your job by taking help of the above points you can continue your job peacefully. Don’t ever let that go out of your hands. Always be on the safe side and keep finding the job your interest lie in. Be it a temporary job or a permanent one, always be serious regarding that as the more serious you are about it, the more seriously the employer will take you if you get interested in. There are many other jobs for which you can also apply for that but at least choose the one with better salary and would suit the best of your interest. Always choose a job around your place to avoid too much time loss as craigslist has a lot of job offerings or ad from many places as it is free. Try not to go for job which is situated in faraway places, as it will be problematic for you. Ensure your job and stay happy. These online sites will help you to get your desired job by just sitting at home and typing. This is very easy, cheap and useful method to do the job with comfort. These things will help you to find a job and be on it until you get one. Being patient is the best thing you can do here as being hectic and impatient will only enrage the employer. You are not the only one who has been waiting to get a job for same company. Maybe there will be many others who opt to get the same job and have better personality or experience than you. So make sure your resume is the best and have each and every detail about your achievements and personality. A person has to get good day by day or he will be left behind. So follow the instructions and make a lasting impression on your employer along with a confirmed job placement.